This is a re-post of one of my submissions to the Worldwide Genealogy blog nearly three years ago. I thought it might be worth a re-share here for National Family History Month 2017. 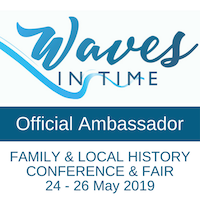 As family historians we need the traditional three Rs of reading, ‘riting and ‘rithmetic, after all how else to locate our families’ records, write their stories and calculate and cross-check their ages, dates of births, deaths and shot-gun marriages. But today I’m going to propose that another three Rs are also needed for our family history research. Traditional wisdom suggests we maintain a research register/spreadsheet which documents every record set and document we’ve checked in the course of our research, either online or offline. This practice, or some variation of it, is certainly helpful to ensure we don’t waste valuable research time searching the same records again and again. However, I’d argue there’s a benefit to visiting at least some of the records more than once. Certainly we should revisit those documents we’ve stored in our files, databases or trees. Because I firmly believe that research findings, and our perception and understanding of them, are not static. The documents themselves will not change but the research “glasses” we’re wearing will certainly change how we see the detail on them. What we know of our history changes over time, either incrementally or in large leaps forward. Things we haven’t noticed about a record will suddenly leap out at us as having a new or additional meaning. The significance of names will become clearer as in the interim we’ve learned of family connections. If we only look at the record the first time we find it, and don’t squeeze it for every single drop, we run the risk of missing the key to a brick-wall breakthrough. And then there’s the one-time search of a particular record set, especially online. I’m sure we’ve all had searches that we’ve rejected as unsuccessful on one occasion, only to revisit the search and see, with those new glasses on, something important that turns it into a relevant record for our research. And what of looking at adjoining pages to see who’s living nearby? We used to do this automatically when searching offline but the downside of an online search is that it takes us straight to our ancestor’s document and tempts us just to exit to the next search without checking out the broader context. Each of us has our own way of recording our family history. Most will keep at least key information in family history programs or trees, either online or offline. Others have their own family websites. Others again will publish the family’s story in a book. 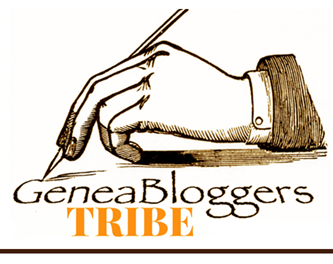 It’s probably a fair bet that the participants of this Worldwide Genealogy blog are also writing their family history online ie writing a genealogy blog. I’ve noticed that when we say “blog” people sometimes conclude we’re just playing around on the internet, telling others what we had for breakfast etc. Some time ago I wrote a post suggesting that we should start reframing how we refer to our blogs, by “telling it how it is” and saying we write our family history online. 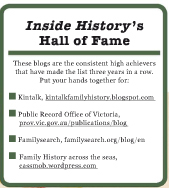 Blogging is a great option for recording our family’s history and revealing the grassroots of history by contextualising it within the broader framework of traditional history. I feel sure that the centenary of World War I will produce many micro-stories of the impact of war on families and communities as well as the contributions made by individuals on both sides of the military fence. This reveals a more nuanced tapestry of history than the big-picture, important-people version that we all learnt at school. It also exposes the sheer scale of war’s impact at the grassroots level. We can do the same for so many aspects of our family history by revealing more about a community, which in turn might lead to a One Place Study. Blogging also provides a less threatening way of starting to document a family history rather than the daunting prospect of writing a book. From a personal perspective blogging suits my approach to a narrative recording my family’s history and allows me to add new information to the family history I’ve published. Of course to a large extent I’m preaching to the converted on this topic. I recently wrote a story on my blog about my research into the Callaghan family of Courtown near Gorey in Wexford. In my research I’d looked at the 1901 and 1911 census records from the National Archivesof Ireland online. The family comprised head of house, David Callaghan, son David, daughter Bridget, daughter-in-law Kate and grandson, another David. Even though it was staring me in the face, I made a stupid mistake and jumped to the conclusion that Kate was son David’s wife whereas it was very clear she was a widow. If I hadn’t gone back to revisit the document, and review what I’d written, I’d have left myself following an incorrect research trail and potentially led others astray as well. A really stupid beginner’s error despite years of experience. You might be interested in my post about the success, the surprise and the assumptions stupidity. I certainly hope I’m not the only one to make such a silly mistake which is why the revisit, record, revise steps are so important. We need to do them in a cool moment not while we’re in the thrill of the hunt for more data and excited by each new discovery. Of course with so many records coming online it’s tempting to just keep searching for new and fascinating titbits about our families. Still we’d be wise to stop every now and then, and revisit what we’ve written or recorded in our family trees. Revisit those documents we have stored, look again at that photo we’ve been mystified by, and assess whether there are certificates we need to purchase, microfilms to be ordered in or another avenue of research to be explored. Record each new discovery and assess what its impact is on the discoveries we’ve made before. Revise our assumptions and family links. There is a constant flow between revisiting, recording and revision. How do you approach your research and do you use any of these steps? Have you made silly mistakes that needed revision?